"Home sweet home is murder." 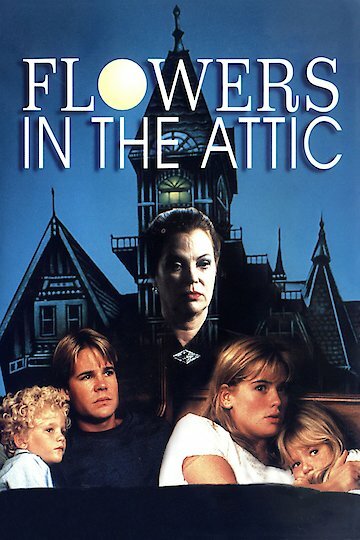 Flowers in the Attic is a 1987 drama about a mother and her children who are forced to live with their wealthy and cruel grandparents after the father dies. When Corinne Dollanganger's (Victoria Tennant) husband dies, she and her four children, Kathy (Kristi Swanson), Chris (Jeb Stuart Adams), and twins Cory (Ben Ryan Ganger) and Carrie (Lindsay Parker), are left penniless. Corrine must move to the home of her mother, Olivia Foxworth (Louise Fletcher), and father, Malcolm Foxworth (Nathan Davis). Upon arrival, the cold Olivia allows the children into the home on the condition that they are to remain locked away so that her dying husband can never see them. Olivia is a religious fanatic and quickly reveals that Corinne's marriage was incestuous, as she was married to her uncle. Another stipulation of Corinne's stay is that she is to be whipped as punishment for her marriage. The children are fearful about their confinement, but their mother assures them that it is only temporary. Olivia hates the children and treats them especially cruelly by starving and humiliating them. For some reason, the children are becoming sick, especially the twins. Their mother's visits have tapered off significantly over the weeks. Kathy and Chris discover that their mother is living a posh lifestyle while they are locked away. After becoming deathly ill, Cory dies. The pet mouse also dies after eating some of their food. Kathy and Chris believe that the grandmother is poisoning them. After knocking their grandmother unconscious and escaping the room, they discover that Olivia is due to marry a wealthy man. They also discover the grandfather's will stating that Corrine's fortune will be forfeited if she had any children in her first marriage. The children now know that it was their mother poisoning them after all. The wedding ceremony is crashed by the kids, who reveal their mother's secrets. She refuses to acknowledge them, and after a brief struggle, Corinne trips over the balcony and is hung by her own veil. The children leave the mansion as their cruel grandmother looks on. Through Kathy's narration, it is suggested that they plan to return to claim the family fortune. Flowers in the Attic is currently available to watch and stream, download, buy on demand at Amazon Prime, Shudder, Amazon, Vudu, Google Play, FandangoNow, iTunes, YouTube VOD online.